“Trudy’s and Dominic’s place is AWESOME. Our dog Petey has been there three times now and I couldn’t ask for better care. Her prices are very affordable, they truly love the animals, and are very accommodating. Petey is very nervous about new places and doesn’t always eat well while we’re away but he loves going to Beacon Suites. Trudy did new things with his food to make sure he would eat and saw to it that he received a little extra love while we were away. 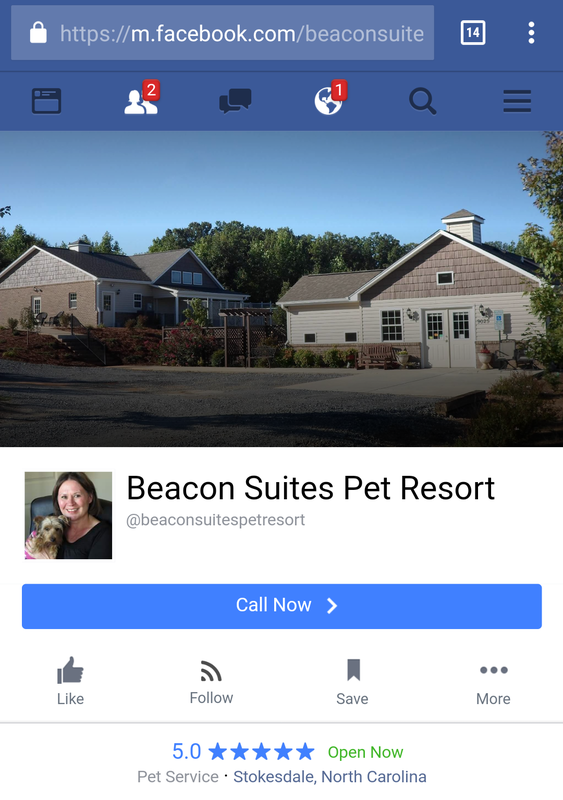 “Can now go on vacation without the dogs now that Beacon Suites has opened. Seriously, I only went where my babies could go too. This was the first Christmas in 8 years away from home, flew to St. Louis for a family Christmas. Left Bucky (Pek) and Cassie (Pom) at Beacon Suites for the first time. By the second day I had to call and Trudy e-mailed pics. Once I saw the faces I knew my babies were fine and happy. Then decided to travel to New Orleans in March. When we brought Bucky and Cassie back to Beacon Suites, Bucky ran in and begin to play with all the toys Trudy had set up for him. He had remembered where he was and they were fine and content when I left. It was like home away from home. I agree with the other reviews, the dogs are given a lot of attention. Thank you guys so much for opening Beacon Suites! “Trudy and Dominic truly have a nice thing going here. Their facility is fantastic, their service friendly, and they were very accommodating towards my dog, Ella. I appreciate the extra attention and care they gave Ella during her stay. This is an unqualified 5-star review. 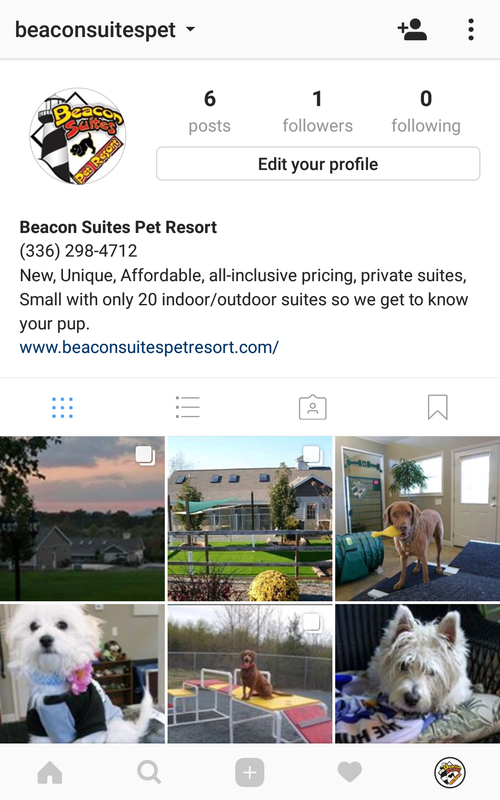 If you are considering boarding your pets at Beacon Suites, give them a try. You will not be disappointed. I just picked up my happy, healthy & freshly groomed dogs after a 36-day stay at Beacon Suites. Although it is very difficult to leave your pets for such a long period of time, Trudy and Dominic did their very best to make the separation easy for our family. They took amazing care of my three dogs, giving them: love, walks and daily medicine. They answered my questions promptly and even stayed open late on a snowy evening so that we could visit our pets during their stay. I could not have hoped for a better experience. 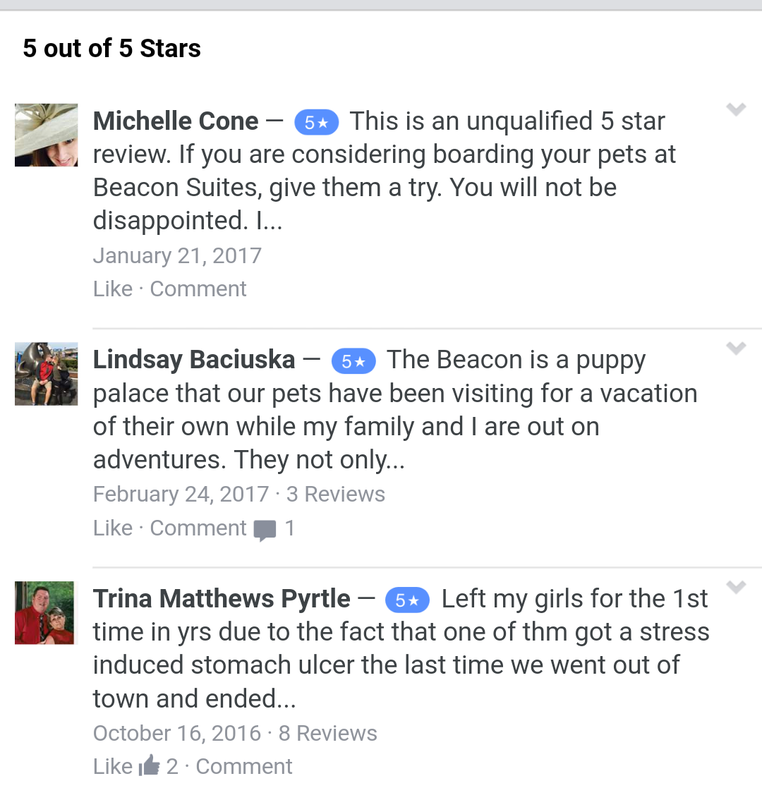 The Beacon is a puppy palace that our pets have been visiting for a vacation of their own while my family and I are out on adventures. They not only take great care of the animals that stay with them, but they also build a relationship with our pets during their stay. They are great for any of your pet needs, grooming, overnights, and puppy vacations. I would definitely recommend leaving your furry friends with this family owned pet resort. Trudy and Dominic always find a way to accommodate our pet family even at the last minute. They take excellent care of our dogs and have provided a safe, clean and loving environment for their “home away from home.” We truly appreciate the TLC they give to our pets. -Karen and Rick B. Left my girls for the 1st time in yrs. due to the fact that one of them got a stress induced stomach ulcer the last time we went out of town and ended up with a hefty vet bill. Came home today to 2 healthy and happy dogs. So happy!! We are big fans of Beacon Suites. We refer to it as “the spa.” Trudy and her crew take excellent care of the pets so we feel very at ease leaving our dog there. I really like that a walk and any administration of medicine is included at no extra charge. I also highly recommend the on-site groomer, Alex, at Studio K9 Grooming. Beacon suites is the best. Our Luna loves being there. Very clean. They take pride in their work. Luna is always happy and excited when she gets there and of course when we pick her up. Thanks Trudy and Dominic!! We have been using Beacon Suites for right at a year now and have received nothing less than amazing service and care for our baby girl Kimber and know that we will have peace of mind that she will be safe and happy while we are away. Thank you for going the extra mile. The very best place we have entrusted with one of our pets. We were very nervous to leave our newest pup for 12 days. Now, we know exactly where to take her! Trudy was wonderful. The facility is squeaky clean and very comfortable. I felt like I had left my pup at a friend’s house. Thanks to Trudy and her staff for taking such wonderful care of our family member…..it really means a lot to us. This is the best place ever for boarding your pets. Trudy really takes time to get to know your fur babies. I totally trust them with my dogs and don’t worry about them one bit when we are gone. The dogs always leave happy and are always happy with wagging tails when we pull into the lot. This is literally like a doggie paradise! The owners truly care about your pet and go the extra mile! Trudy had our two fur babies for 10 days and took wonderful care of them! You can tell that Trudy really loves what she does and how much she cares about your furry family member(s). Top notch facility, clean, well maintained and wonderful people. The prices are very reasonable, probably less than what you will find for a place that isn’t as nice. Don’t hesitate to take your pets here, they will love it! Great place to bring your dog. They take care of your dog like they are their own. Thank you so much for having Beacon Suites. Trudy, I recommended your care to another friend today. I am so grateful that you located in our area. You are the best with Ellie. Thanks again! Very clean, Trudy goes above and beyond to take care of your dog. It is a true Resort for a dog. Love this place! They are very friendly, treat our 3 as part of the family and very clean facility.